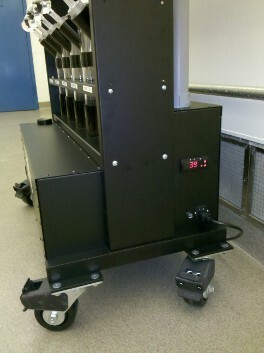 CCS2000 Chiller System for Metabolic Cages for use with Mice | Hatteras Instruments, Inc. The CCS2000 Chiller System is designed to chill and maintain MMC100 Metabolic Cage samples at or below 45°F (7°C) throughout the collection process. In addition, the cool air produced from the system can reduce the temperature inside the Metabolic Cage, sustaining the mouse in a more comfortable environment. 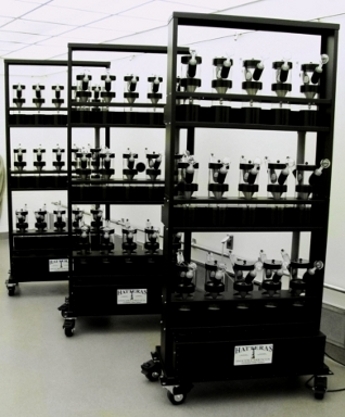 The CCS2000 is an integrated system consisting of 15 Metabolic Cages, the Metabolic Cage Rack, and a Cooling Unit. Each component plays a role to make the cooling process possible. The Cooling Unit is the heart of the Chiller System. Built into the base of the Cage Rack, the unit stores all the electronic components to power the system, refrigerate the samples, and regulate the temperature. The user can adjust and check the sample temperatures through the control panel and display screen located above the power switch. The Cage Rack is the support structure for the Chiller System. It protects the Cooling Unit and secures the Metabolic Cages through stabilizing shelves. The Cage Rack also houses the ports where the Metabolic Cages connect to the Cooling Unit. For more information on the Cage Rack, please click here. 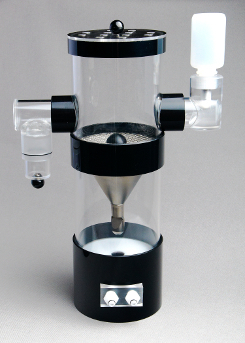 The Metabolic Cage used with the Chiller System is an adaptation from the standard MMC100. The standard and chiller Metabolic Cages are identical in features, performance, and collection rate. The only difference lies in the cage bases. While the standard Metabolic Cage base is made from a solid bottom cylinder, the chiller Metabolic Cage base is divided into two pieces: the bottom cylinder and the insulated cage base. The insulated cage base holds the urine collection vessel. There are two plugs on the outside of the base that connect into the ports located on the Cage Rack. Once connected, the Metabolic Cage is able to access the Cooling Unit and keep the urine sample refrigerated during collection. For more information on Metabolic Cage features, uses, construction, etc., please visit the MMC100 Metabolic Cage portion of our website. The CCS2000 Chiller System is a new and simplified method for refrigerating collected mouse urine samples at or below 45˚F (7˚C). By decreasing the sample temperature, the Chiller System increases the sample quality for a more precise sample analysis. If you have questions about the CCS2000 or would like to request a quote, please Contact Us.